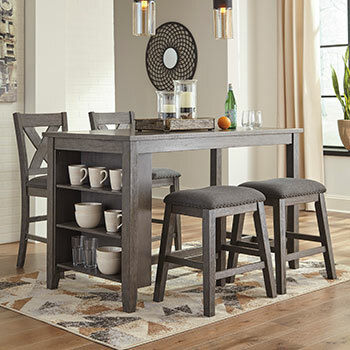 At Overstock Furniture, we have everything you need to create an elegant dining space that your family and friends can enjoy. 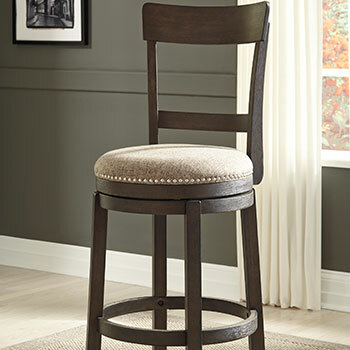 We sell dining room sets and home bar furniture, all from top name brands you can depend on. 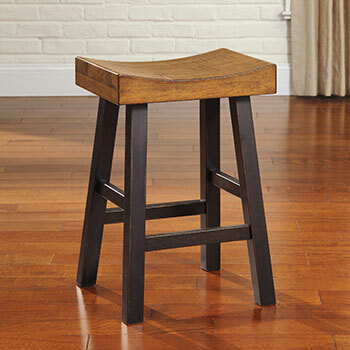 To learn more about our large and diverse product selection, we encourage you to browse our furniture catalog online or in-store today! Dazzle your guests during your next dinner party with one of our beautiful dining room furniture sets. 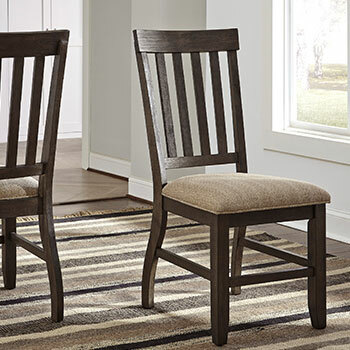 Each dining set includes a table and a complete set of dining room chairs, all for one conveniently affordable price. 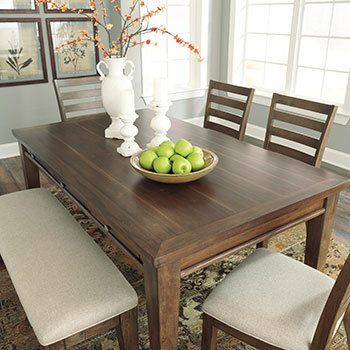 Our dining sets come in a wide range of sizes and styles, so whether you need to furnish a cozy kitchen nook or a lavish formal dining room, you can expect to find a variety of products perfectly suited for you. We have counter height dining tables with pub stools, dark wood tables with upholstered high back chairs, and we even have dinette sets for two. No matter which type of dining set you choose, you can always expect a finely-crafted product that will last for years to come. 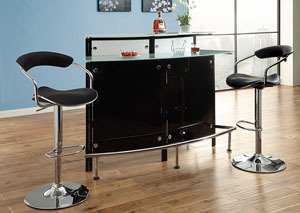 If you have extra space to spare and want to truly “wow” your guests, consider purchasing a piece of home bar furniture. We sell wine racks and wine cabinets that will help you organize your spirits in style, as well as home bar units that will let you play bartender for the night. Would you like to provide your guests with an area where they can enjoy a nightcap or a cocktail? 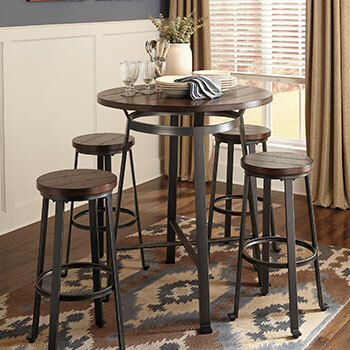 Purchase one of our bar tables to experience the charm of a cocktail lounge right within your home. 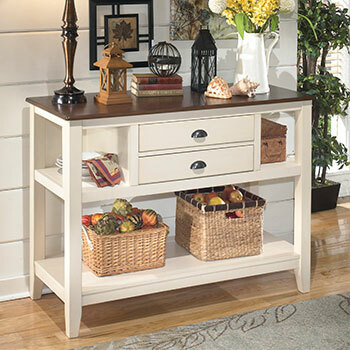 In addition to these great products, we also sell buffets, dining servers, and so much more! 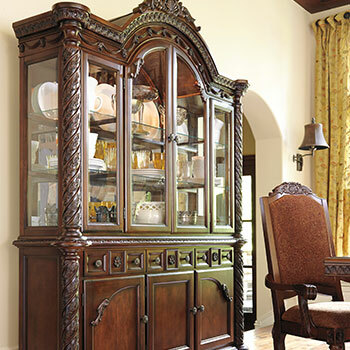 Simply put, we are a one-stop-shop for all your dining room needs. 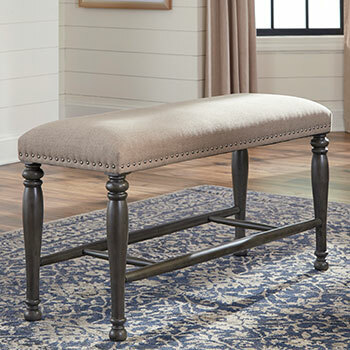 To shop our complete furniture collection, you can visit us in Woodbridge, VA or at any one of our five furniture store locations. 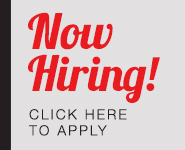 The sooner you shop with us, the sooner you can start saving!